Job growth slowed in January, as the nation’s employers added 151,000 net new jobs, compared to over 250,000 in each of the prior three months. However, while slower job growth may be a function of recent market volatility and slower growth abroad, it is far too soon to draw any such conclusions from one month’s data. As my monthly smoother shows, average employment gains are solidly over 200,000 in recent months, and if this underlying trend persists, the labor market will continue its steady trek towards full employment. Unemployment ticked down slightly to 4.9 percent, and for the “right reasons”—i.e., more people got jobs as opposed to more people gave up looking. Average hourly wages were up 2.5% over the last year—that’s an acceleration over the 2% pace that prevailed earlier in the recovery, signaling that the tightening job market may finally be giving workers a bit more in the way of bargaining power, something they’ve lacked for a very long time. I return to this critically important point below. The average work week ticked up a bit as well, and 60 percent of private sector industries added jobs, including an unexpected pop in factory jobs, up 29,000 last month, the sector’s strongest month since November of 2014. In other words, despite the slowdown in payroll gains, today’s report should be considered yet another entry in a series of quite positive jobs reports. 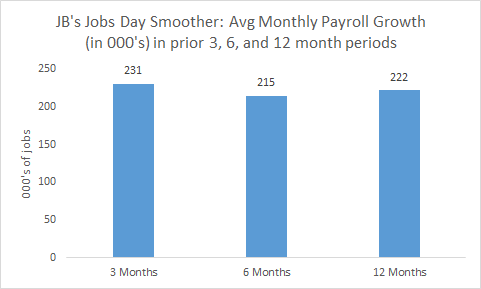 Remember, these are sampled data, and the monthly confidence interval in payroll gains is 100,000, meaning that the true monthly number of net jobs added is likely between 50,000 and 250,000. That’s why it’s useful to smooth out the monthly bips and bops using JB’s patented smoother, shown below. Over the past three months, the average monthly gain has been about 230K, and the other bars show this has been around the trend growth rate for the past year or so. Now, on to this month’s Rorschach test. Focus on the hourly wage growth line (orange?–I’m color blind!) in the figure below (I’ll get to the other line in a moment). That circled bit at the end shows the acceleration I referred to earlier, and it is very much what I and other fans of tight labor markets have predicted (and longed for!) for quite a while now (this is the average wage, but, importantly, production worker wage growth is following a similar pattern). Do you see that uptick and think, “Great—we’re getting closer to full employment and that means that the benefits of growth might have a chance to be more broadly shared! USA! USA!”? To be clear, we’re not yet at full employment. The underemployment rate (U-6) has been stuck at 9.9%; my estimate is that it needs to be 8.5% before we’re there. Or do you look at the line and say, “Janet, slam on the breaks!”? 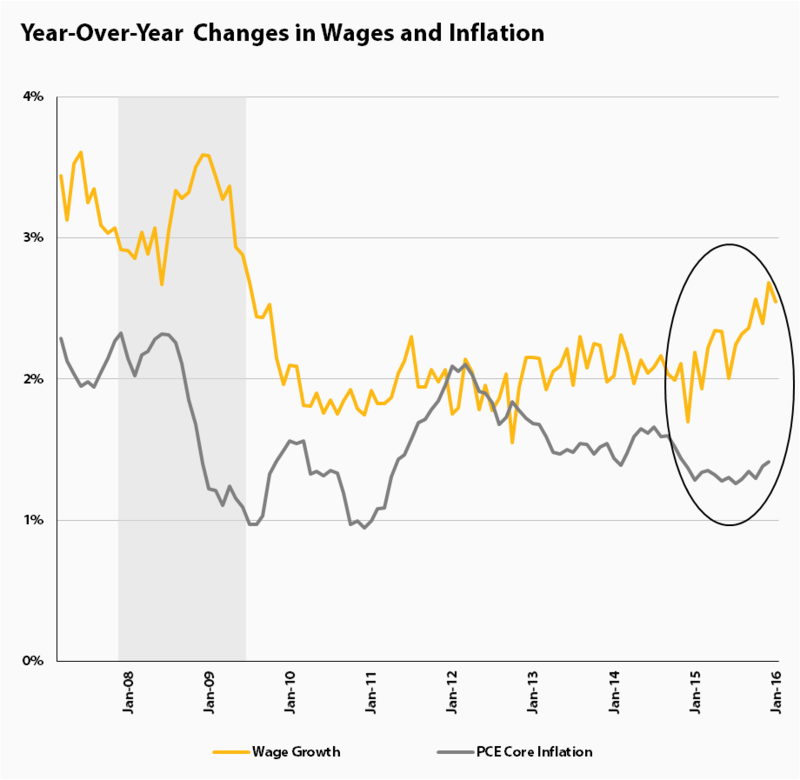 IE, as wages growth faster, you worry they’ll bleed into prices and the Fed better act now to preempt that possibility. If that’s where you’re coming from, and I sincerely hope it’s not—remember: periods of full employment have been the big exception over the past 40 years—then look at the other line, which plots PCE core inflation, the Fed’s preferred metric of price pressures. It is not showing any commensurate acceleration. True, the Fed needs to look around the next corner in this regard, but if anything, expectations are deflationary, in no small part due to the headwinds from the strong dollar and sharply slower growth in emerging economies. Such headwinds remind us that there are unquestionably economic jitters out there in the world that bear close watching. But the US job market continues to truck along, adding over 200,000 jobs per month on average over the past year, helping to push the unemployment rate closer to full employment, and, most importantly, providing workers with a bit of the bargaining power they need to finally claim their fair share of the growth they’re helping to produce. Share the post "Jobs Day: Slower payroll growth but faster wage growth as we get closer to full employment"
3 comments in reply to "Jobs Day: Slower payroll growth but faster wage growth as we get closer to full employment"
I always look for your articles on Jobs Day. I love your rational analysis and lack of hype, and the regular references back to the overall trends and “Job Smoother.” Hope this series continues. It seems to me that wages need to grow faster than inflation, GDP, and other measures, for an extended period of time. The overhang of the housing collapse and student debt is still with us, and I don’t see any way out of it except to slowly grow wages relative to other components. Debt relief would make sense, too, but housing debt and student debt cannot be modified in bankruptcy. Thank you for your insights, always right on point.